Answers to frequently-asked questions, and resources to help you get started in agility. How do I find out if my dog can do agility? Beginners often think that they should try their dog on equipment to “see if he’s a natural” or “see if he has potential.” In reality, agility equipment means nothing to your dog at first. It’s just a random group of unfamiliar objects. You create value for each obstacle by rewarding the dog for executing it correctly and, over time, it becomes enjoyable for the dog because it’s associated with many good experiences - and most of all, with you. Dogs don’t independently do agility – they do it with you, because you make it so much fun. That takes time and training. You don’t need a particular breed to succeed at agility. Many different breeds, and mixed breeds, compete at the highest levels. And you don’t need to start with a puppy; your adult or even senior dog may be a great potential agility dog. Most dogs, if they are physically able, can learn to do agility at some level if the handler is dedicated enough. Agility can be a confidence booster for anxious dogs, and an outlet for dogs who need a focus for their energy. Every dog is different, and some dogs don’t enjoy agility or cannot handle the excitement of competition. But agility training can teach valuable life and social skills, even if the dog doesn’t compete. Whether you’re aiming for a spot on a world team, just want to have fun with your backyard champion, or you’re somewhere in between, agility training can help your dog become a better family member for life. How long does agility training take? The amount of time it takes to train a dog to do agility varies and depends on many things, such as the age and temperament of the dog and the amount of time the handler has to practice, but expect to spend 6-12 months or more in training before you start to compete. Agility requires skills from both dog and handler and a high degree of teamwork, and that takes time. Agility is taught using positive methods and games, and the entire process should be a lot of fun for both dog and handler. How old does my dog have to be to compete? Most agility organizations require dogs to be at least 18 months old before they can compete, although there are some introductory levels available to dogs aged 15-18 months. Let your puppy mature and allow young bones to finish growing before starting to compete. Never rush a young dog’s training, and be especially careful with jumping, which is hard on young bodies. There is, however, lots of fun foundation work you can do with young dogs to prepare them for their athletic careers while they grow up. A good foundation, including things like focus, impulse control, basic obedience commands and a reliable recall, makes agility training easier, faster, and more enjoyable for both teammates. I’m new to the sport. How do I get started? Find a local agility training class that emphasizes positive training and sign up for a beginner or agility foundation class. Visit a class before signing up so you can see the facility, watch the instructor, and decide if the atmosphere is right for you. Don’t be afraid to ask questions. Be sure your instructor has the experience to help you achieve your goals, and a teaching style that’s a good fit for you. Agility training should be fun! If you need advice on getting started, send us an email. How do I find a training class? Sirius focuses primarily on training handlers for USDAA competition, and might not be the right choice for you if you do not have competition goals. Canine Capers has a large indoor training building. 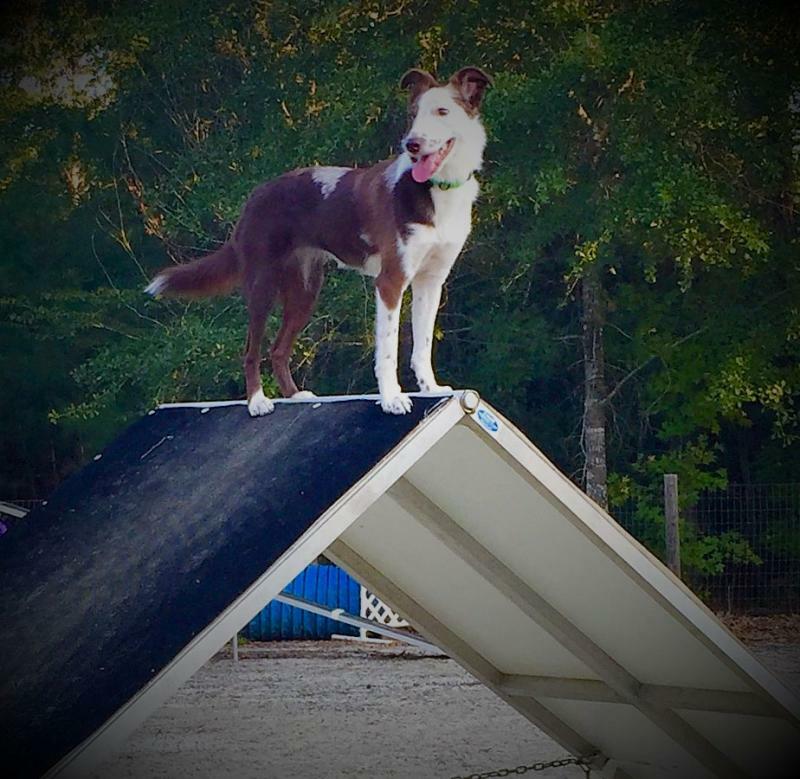 Lucky Dog has a welcoming atmosphere for beginners, and also offers barn hunt, flyball, and a dock diving pool. What organizations offer agility competitions? All of these organizations have calendars on their websites, so you can find agility trials in your area. Each organization has its own requirements for entry, but all require you to register your dog before you can enter a trial. Registration is a one-time process that is valid for the life of the dog. Once your dog is registered, you receive a registration number that you’ll need in order to fill out the entry form for a trial. The entry form is part of a larger document called the trial premium, which gives you information (such as the location, dates and times, judges, schedule, and classes offered) about competing at that particular trial. Look on the About NADAC Agility page of this site for instructions on registering your dog with NADAC. If you’re planning to enter a Circle of Friends trial and need help registering or filling out an entry, don’t hesitate to contact us. We’re happy to help! How high will my dog have to jump? What should I bring to a trial? Bring a secure crate for your dog to stay in while you’re walking your courses or otherwise occupied. If you plan to keep your dog in your car during the trial, consider weather conditions and make sure it’s safe to leave your dog. Bring a copy of your trial premium, your confirmation, and your dog’s registration number. Pack the usual things you’d take while traveling with your dog for a weekend outdoors: food, treats, water, meds, dishes, vaccination records, emergency contact info, toys, beds, etc. Most people bring a portable chair so they can sit with their dogs and watch the ring. A shade cloth to block sun from your crate can be useful in hot weather. Setting up on a tarp or mat will keep your belongings cleaner. Electricity may or may not be available, so consider using battery-powered heaters and fans. Follow the instructions in the premium regarding when you are allowed to come onto the property and set up your crating area. Be considerate and don’t take more space than you need. Expect people to set up their crates right next to yours at a crowded trial. If that makes your dog uncomfortable, help your dog and move to a less crowded area. Monitor your dog’s behavior and do not permit aggressive behavior such as barking or lunging at passing dogs from inside a crate. Do not allow excessive barking. Be a good neighbor; you likely will see the same people again at future trials and they may end up becoming dear friends. There are lots of agility training groups, online training courses, and videos of agility training available on the internet. Top trainers offer courses at sites like www.agility-u.com, www.oneminddogs.com, and www.susangarrettdogagility.com (these are just a sample). Be sure you get your training tips from reputable sources. Happy training and trialing! Need more help? Just ask us! Copyright 2014 Circle of Friends Dog Agility, LLC. All rights reserved.